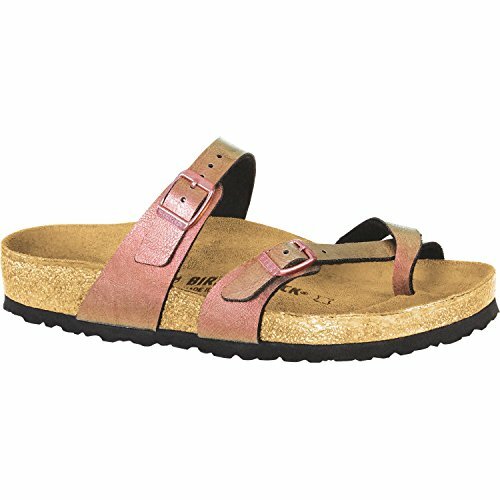 Premium leather or Birko-flor upper with adjustable buckle closures to ensure easy on-and-off wear and a secure fit. Birki-flor is made of acrylic and polyamide felt fibers. Anatomically correct cork footbed, crafted from cork that is 100% renewable and sustainable, encourages foot health. The suede lined, contoured footbed will mold to the shape of your foot creating a custom footbed that supports and cradles you each and every step. Raised toe bar is designed to encourage the natural gripping motion of your feet, exercising your legs and aiding circulation. Made in Germany.